Shriram Greenfield O2 Homes, an exquisite project by Shriram Properties is going to offer an exclusive and extraordinary panorama of a luxurious home. This project is located on Budigere cross in Eastern quadrant of Bangalore. If you are searching for a home to attain tranquility and peace along with a life of luxury then Shri Ram O2 is your stop. This prelaunch project is sprawled across 19.5 acres of landscape surrounded by lush greenery all around. There are total numbers of 1645 apartments in this project nestled in G+18 Floors in 9 towers. This exquisite creation is going to offer you variety of option like 2, 2.5 and 3 bhk homes to select your desired abode. All the basic civic amenities like hospitals, malls, schools and recreational centres are accessible from this project and that is why Shriram Greenfield is one of the popular choices of Home seekers. Shri ram properties is known for the exceptional quality and leap bouncing developments in all types of real estate developments be it residential, commercial or mixed development. 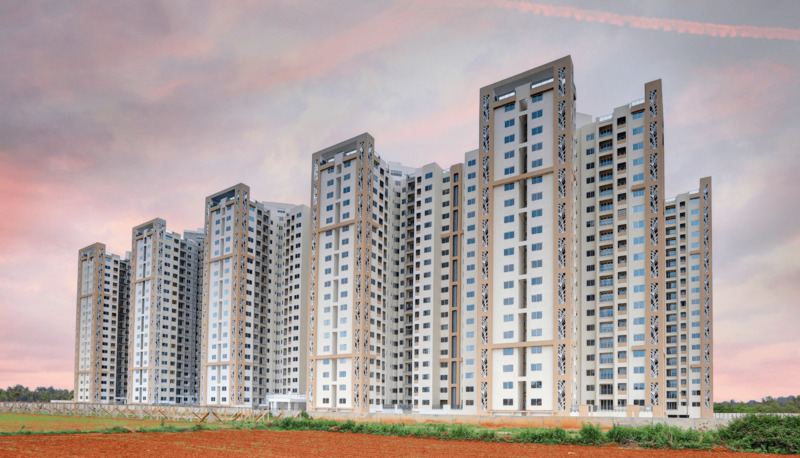 Shriram Greenfield O2 Homes is ideally located on Budigere cross in Old Madras Road in Eastern quadrant of Bangalore. Localities like Hoskote, Horamavu, Chikkagubbi, Anagalapura, Ramamurthy Nagar, Kuvempu, ITPL, Whitefield and KR Puram are its neighbours. Also it is in the proximity of IT fields like Whitefield and Marathahalli at the distance of 7 and 11 km respectively. Being one of the rapidly growing locations in East Bangalore this locality has International Airport at the distance of 35 km which can be reduced down by 20 km after the proposed ring road in this area. The nearest railway station is Whitefield railway station. There are all the civic amenities nearby like several schools, hospitals and shopping zones. GKBMS School, Citizen English High School, Bharath Matha School and VIBGYOR High School are some of the nearest educational centres. Srinivasa Hospital, Mission Hospital, Shreyas Maternity Hospital, Dhruva Nursing Home, Kemanna Nursing Home and Asha Nursing Home provide healthcare facilities to locals. Shriram Properties, winner of the Best Developer in Southern Region Award from ASSOCHAM, is a part of the 60,000 crore Financial Giant – Shriram Group and was established with a mission of creating splendid homes and amenable living spaces. Launched in 1995, we have operations throughout the country with extensive presence across South India. We have delivered over 8.36 million sq. ft. of built-up space, with 12.61 million sq. ft. to be delivered and 45.85 million sq. ft. under development. “Be ever Respected as the most trusted, honest and progressive corporate in the Real Estate Industry” We are continuing our legacy of delivering trust on the lines of simple living and high thinking. We provide sensible residential apartments and commercial spaces that offer best value for money. After establishing ourselves as a trustworthy brand in tier 1 and tier 2 cities, with real estate projects like residential apartments, integrated townships, commercial spaces and SEZs, we are now ready to make our presence felt in other cities across India. Our policy is to offer you the best value for the money invested. The number of utilitarian residential apartments and commercial spaces that adorn the skylines of several cities stands testimony to this. With our prestigious projects of residential apartments, integrated townships, commercial spaces and SEZs in tier 1 and tier 2 cities, we are now gearing up to make our presence felt in other cities across India.